This week my schedule is all out of whack but that’s okay because I am on vacation! We’re only going to be home for a couple days so P90X will be put on hold for 1 week so that we can stay on track with out workouts. I don’t want to miss any of them. Right now I am half way through the program, just finishing week 6. On Sunday, July 25th I ran my second half marathon with my mom. We ran the Lacamas Lake Half Marathon. This race was much a lot different than my first half marathon in January. The weather was obviously different in July. It was a very warm run starting at 8am. The sun was out the entire time but luckily there was a lot a shading and water/gatorade stops every 2 miles. It was such a relief having liquids available. This race t-shirts was cuter and fit better than the first one. 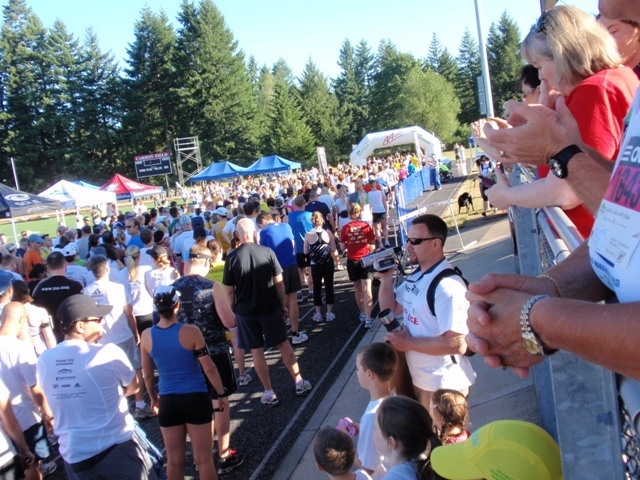 When race time came all 771 runners crowded together to get going. We left the high school and headed down a long hill and started our trek around the large lake. Starting out I felt good. I think I felt good for the first 4 or so miles (even though I had to go to the bathroom but didn’t want to wait!). Around mile 5 the route took a detour off the lake path and up one hill, then up another painful hill (named payne hill). Finally at the top of the second hill I had to make a honeybucket stop. Once we got going down the hill my achilles pain started up but only for a little while. I was lucky that it went away so quickly. We were back on the lake trail by mile 8 and starting to feel a bit tired. When we got to mile 10 I was aching. It started to feel like mile 12 of my first half marathon. My knees were getting really stiff. I know my mom was feeling achy too. We made it to mile 12 and rounded the corner to go UP the hill similar to the one we started descending from the start. I remember this hill from a 10 miler I did many years ago. It was KILLER! We ended up being able to walk it faster than we could run it. Some people in the neighborhood had their sprinklers out for runners and there was even a guy watering his plants that would spray runners as they went by. It felt so good with the hot run beating down! I was so glad to see the stadium with my dad, brother and sister in law cheering us on. But, I was in a lot of pain too. I don’t know where my knee pains came from since most of my long run pains have been with my achilles but I kept running/limping to the finish. We pushed to the end…. And finished in 2 hours 9 minutes and 14 seconds with an average mile of 9:51. My goal of beating my previous time (2 hrs 3 mins 42 sec) didn’t happen but I’m not disappointed by that. I know we really pushed our selves and I couldn’t imagine running any faster. The combination of heat and hills made this race so much more challenging. It took me 2 full days to feel back to normal from this. I was pretty dehydrated from it and running in the heat. It’s been 9 days and I haven’t run since… maybe I need to go hit the road for a short run. 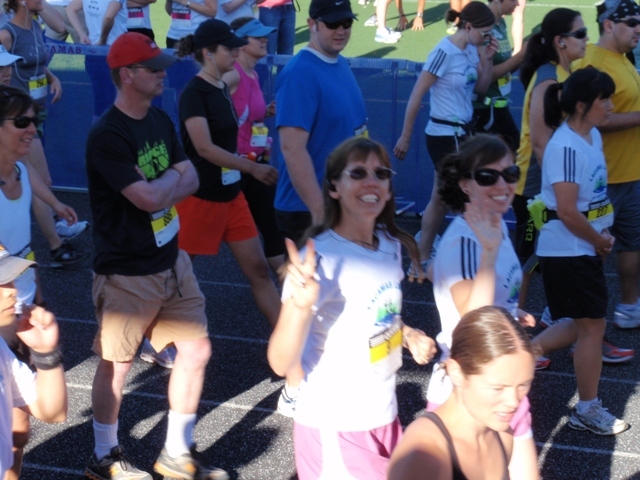 Heather, how cool that you can run a 1/2 marathon with your mom. Congrats to you both. I know how it is to try and beat a time, but the truth is you still completed the race & did awesome. Hope your knees feel better soon. Good for you! Even though you didn’t beat your previous time, that is still amazing! One day I keep telling myself I will compelte a half marathon. I just need to get back into running. You are definitely an inspiration! WOW! Congratulations to you and Lynda. Tell Lynda she looks great!! You do too, of course! Great job finishing a tough run. 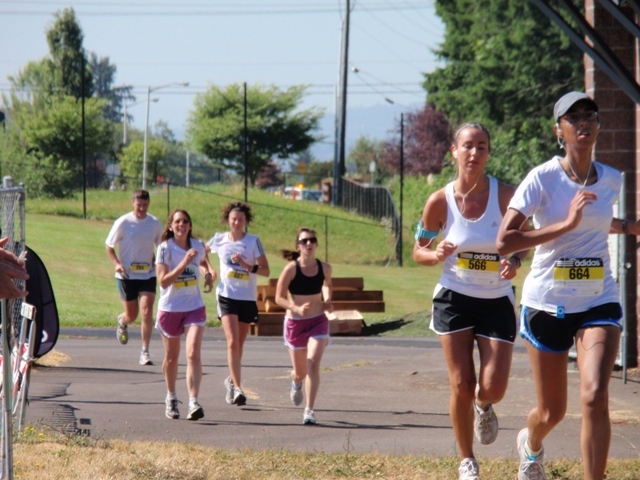 How awesome it is for you to run with your mom! I need to get a running partner. Maybe my husband? 🙂 I’m hoping to do my first half in Oct. but this past Monday morning my shins hurt so bad! So I made myself take 3 days off completely. No running, exercise, nada. I’m scheduled to run a 5k this weekend, so I hope this rest will do me some good. I really want to run a half. So even if I only do it one time and then can’t anymore because of pain, at least I can say I did it! Congrats to you and your mom.